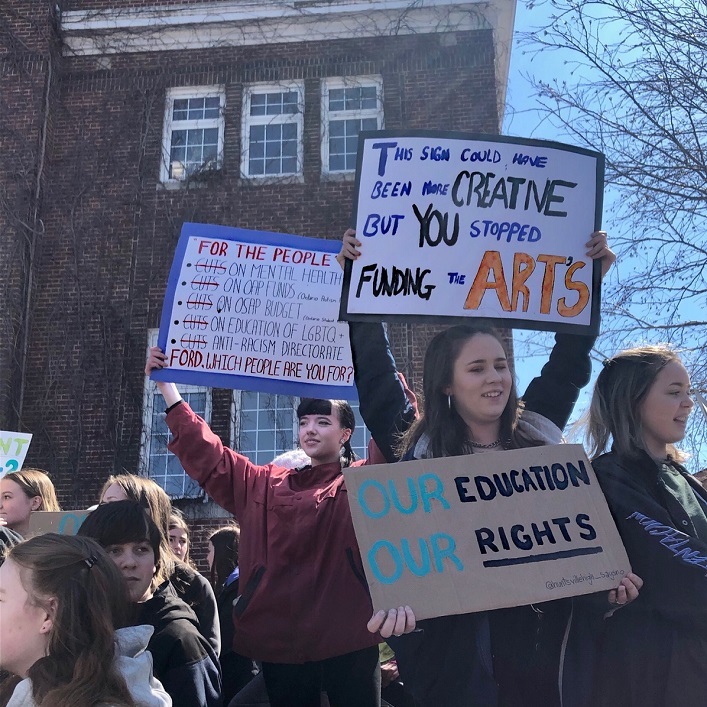 Hundreds of students from Huntsville High School (HHS) walked out of their classrooms today at 1:15 p.m. in protest of planned changes to the Ontario education system. 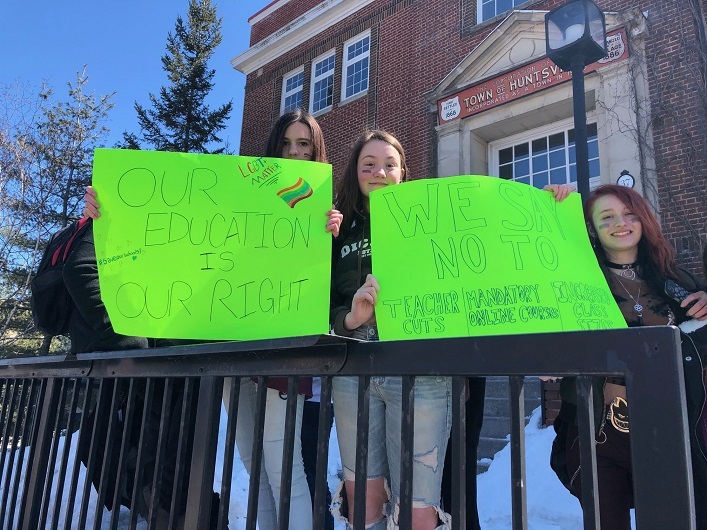 The protest was organized by grade 12 students Cami Greenleaf, Emily McDougall, Chloe Peca, Madison Buck and Zach Belfry. The group was joined by some grade 7/8 students who were also worried how the changes would affect them when they enter high school. Greenleaf said that Premier Doug Ford has recently proposed numerous changes to the education system that not everyone agrees with. Those changes include an increase in class sizes which will result in less one-on-one time for students and a loss of jobs for teachers; funding cuts to the Ontario Autism Program which will remove essential services for students with autism; and four mandatory e-learning credits, a method of learning that not all students want. “Even those of us who don’t feel directly affected by the new changes can understand how much this will affect the lives of students around us, and how it will negatively impact our education,” said Greenleaf. Greenleaf, using a microphone and speaker so that the large crowd could hear her, made a speech to the students and those who stopped to show support. Greenleaf’s speech moved many of her peers and the adults attending, and some were even tearing up. 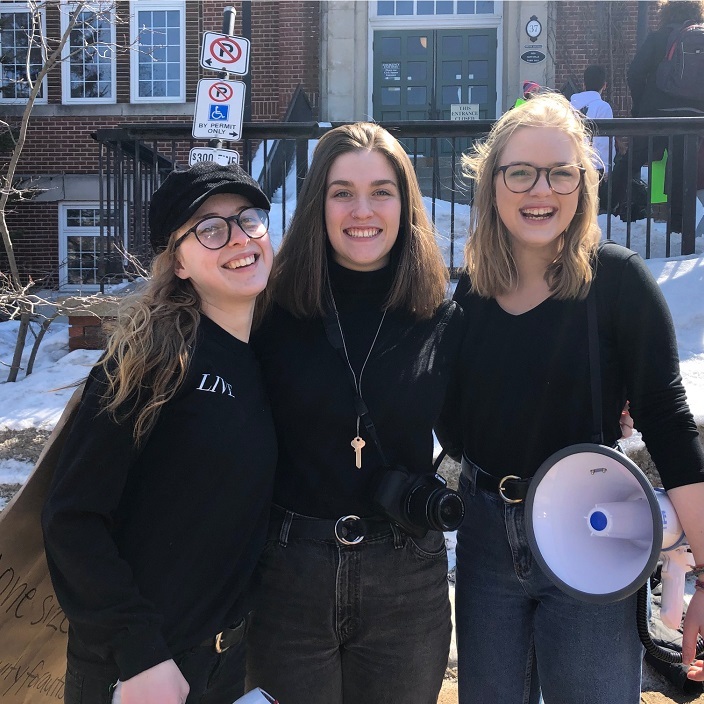 The group also expressed that although they respect the leaders in government, they want to show how strongly they disagree with these decisions. The #studentssayno movement was a province-wide initiative with walkouts occurring in Sudbury, Hamilton, Durham and many other cities. Amazing when people stand up for what they believe in! Way to go Huntsville Students! A jurisdiction that cuts educational funding shoots itself in the foot and finds itself with a permanent limp down the road, when it should be striding into the future. Good on you, HHS kids. You’re getting it right.